It is June 26, 2015, at 8:10 I received a phone call from Sky….sobbing, Grampa died an hour ago. His cousin Mark is there. I had called Red Elk this afternoon to tell him that everyone was praying for him now, and people were coming to visit, and he said he was sleepy, and that I had woken him up. I could tell he was weak and didn’t sound like himself. I told him of people who were intending to come, and people who wanted to have word of how to help, and how I requested he receive company and prayers for release from pain. I told him I loved him and would call back later to check on him. I will keep you updated. I will be helping the family figure out how to handle the expenses and arrangements. I will let you know what is needed as things unfold. Red Elk served unselfishly mankind, prayed for others and asked for prayers for himself. He would call me to ask me to pray for those he loved. Red Elk just celebrated his 73 birthday on June 18. I love you Red Elk, God Bless You, and I will be here for you still and your family. Posted on 26 June '15 by Living Documents, under Death, Red Elk Speaks. Good journeys, from this to the next. Red Elk will be watching the events he described in his Great Vision from the best stadium seat available surrounded by many friends. He always helped others first, regardless of his personal burdens. I’m so hurt by this Grandfather. Please forgive me I never got a chance to tell you how much I loved you. I never felt comfortable calling you grandfather because I never felt anyone was worthy of such a title until maybe a few days ago(before you passed). Truly you are Grandfather to myself and many others who have never even met you. Brother please forgive me if I let you down or disappointed you. I know God is God of the living and not of the dead and so in honor of this truth I tell you father Redelk that I truly loved you and always will. I don’t know how I’m going to learn to be a true man’s man without you here to show us but i’ll find a way. I love you so much Red Elk. How can I love someone I never met so much I don’t know. But I love you Brother. See you in the kingdom of our Lord Jesus Christ. Amen. My father, my father. I LOVE YOU GRANDFATHER!!!!!!!!!!!!!!!!!!!!!!!!!!!!!!!!!!!!!!!!!!!! See you in the kingdom. Aho! God bless his family & give them strength in this time of sorrow. Red Elk will be missed. Hi Heather – please let us know what can be done to help Red Elk’s family. Grandfather Red Elk was the REAL DEAL. Red Elk will be missed. 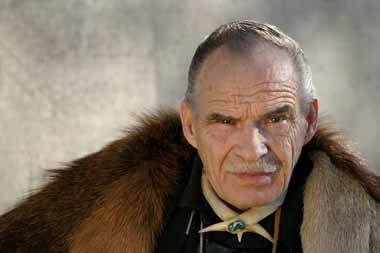 I fear Red Elk’s passing was another sign on the road for America and the world. Buckle up tight….it’s gonna get bumpy real soon. On behalf of the sovereign family heads of the area known as treaty six, I send condolences From Canada. Red Elk prayed for the Embassy and the work we do and continue to do. His encouragement and input will be missed. Im so sorry to hear of Red Elk.my heart goes out to his family..
, for without Red Elk,i may not have had the experiences i did. RED ELK, , Pop has called you home.God Bless. You who walked alone among races we can scarcely guess. as not to irrevocably weaken a link in the chain. your kind words are not forgotten. im going to miss you. My prayers to family. Thanks to Red Elk for all his gifts to us. The folks over at C2CAM have set up a nice tribute page for Grandfather Red Elk including a couple classic clips from his interviews with George Noory. My prayers to his family. I had a feeling/thought a few months ago that Red Elk would pass before the things in his vision unfolded. God bless all of you and may he keep us all safe. Red Elk is a wonderful medicine man and man with a wonderful family who Darrall and I think the world of and dearly love! Our prayers of comfort go out to Meachelle and the family! R.E. will be missed!! Heather is there going to be a memorial??? September or October, I will keep everyone posted. Years ago when I was about 15 my dad showed me some of red elks stuff around the time he said he had a vision that man wasn’t prepared for the coming events and he was enlightened to delete everything to protect man’s vulnerability. I hadn’t thought about him much since then. Today I randomly thought of him and his prophecies. Rest in peace red elk. Yesterday I had a feeling Red Elk had passed on. I came across his blog a few years ago. I bought his Short Stories book pretty soon after it came out on Amazon. Then I bought several more to give to family members. Red Elk will be missed, but he is with our Heavenly Father/Jesus/Holy Spirit. A place of Love, Paradise, Heaven. I was not shocked when I saw he had passed, I had a feeling. God bless you all!!!! My deepest sympathy for your loss. He is part of the great cloud of witnesses now. I’m late with the acknowledgement, brother, but as Patty stated, Pam and I were “in the loop” on the inner planes when you translated; there was no surprise. Knowing you through our online back-and-forth comments and photos…that has been an honor and a privilege from the start, and will continue to be so. It is the night of September 28 2015 22:44 E.S.T. My girlfriend and I are sitting in the driveway of our burnt down Long Island home. It is peculiar coming to this depressing land only to find out that Red Elk has passed. I’m so sorry to hear about your home. See if you can reach Red Elk in your spirit or during your dreams. He’s been contacting many folks, and his message is to focus on the hope.